A notion in web design and SEO that gets overlooked more times than I care to contemplate, is the security of your WordPress website. I ask people all the time around our office here in Durham, NC how they secure their WordPress websites and the answer I get more than anything is…what security? As a developer this hurts my heart, here are 10 tips to improving the security of your WordPress website. A common tactic for breaching WordPress websites is simply trying to brute force their way in via a login function. By adding functionality that will ban users from attempting a failed login multiple times you can easily cut off a well used method of hacking attempts. We recommend Login Lockdown for ease of use. If I had a dollar for every time a client used a password like 12345a or password1234 I would be a very very very rich man. Don’t be that business who has their website compromised due to laziness. Make no mistake, using an easy password comes from being lazy and it puts you and other people at risk. If you’re a website which collects customer information and you use a password like password12345 you may be held responsible for any beach of data. Use detailed passwords and change them every 3 months. This may seem like a trivial change that most people instinctively do when creating the admin user but it comes up more than it should. If your username is still “Admin”…..please delete it. This is an easy target for brute force attacks. This coupled with bad password management are the two biggest security exploits targeted to WordPress websites. You have to create a new user account with Admin access and then delete the default admin user. I will start by saying, I love 2FA. It is one of the bright spots of modern security and it can be used in thousands of different products and services, your website included. 2FA can be introduced on your login page and requires a unique code to be entered along with the username and password. The code is generated and sent to your personal mobile device. In order for an unauthorized login to happen the attacker would need both an appropriate login AND access to your personal mobile device. This exponentially increases the security on your login portal and is more than enough to deter 99 percent of brute force attacks. You can learn more about Two Factor Authentication here. WordPress is known for its constant update pushes which makes it one of the most secure platforms in the world. As an open source platform, WordPress has thousands of people daily trying to find exploits in the code. Once these exploits are identified the hard working WordPress development team issues patches as updates. WordPress updates almost always address some sort of security flaw. By not updating your website in a timely manner you are knowingly allowing active exploits on your website. It’s really easy to find out what version of WordPress websites are running. It’s right there for the world to see in your site’s source view. If you’re like many businesses out there and do not updated your website regularly, you are at increased risk if your version number is public. Updates are pushed to fix security holes, if you don’t update and show what version you’re using, you are basically telling an attacker what method of attack to use. You can hide your version number with a large number of plugins, I highly recommend doing this. When setting up your website take care to only connect to your server through SSH or SFTP. I would recommend using SFTP connections over traditional avenues like FTP because of the extra layers of security with SFTP. Using these connections allows a much safer uploading of files to your website and nearly all hosting providers offer this as part of a security package. If you read this and don’t know what any of these words mean….contact us…we can help! This is in all caps for a reason. BACKUP YOUR WEBSITE PEOPLE. This is one of the most important aspects of web security…the insurance policy. No matter how hard you try to secure your website we are all human and there is always a chance mistakes were made. By backing up your website (preferably not on the same server) you are able to immediately reload a website that may be compromised to it’s last secure configuration. This is also a plus for companies who have employees that may not be extremely qualified to use a WordPress website or server and may “break” your website. 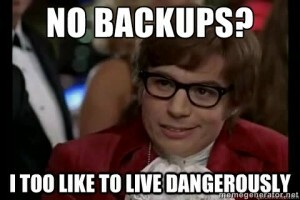 Having a backup is a necessity on today’s internet. If you don’t backup your website and it is breached or broken. The website is gone forever and will need to be rebuilt from scratch. I have had this conversation with many prospective clients who come to us in dire times, it’s never easy to tell someone all the work you put in in gone forever. Hope for the best, plan for the worst.